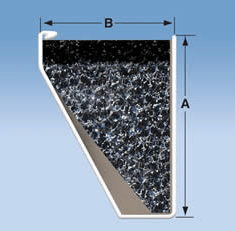 TJM Innovations started as a foam gutter filter manufacturer and distributor with our GutterStuff® brand of products for residential and commercial use. Our foam fabrication process starts with quality materials made up of 100% reticulated, polyether foam. This is extremely important as it can withstand outdoor environmental conditions such as moisture and heat over an extended time. We also manufacture safe water foam products used for cisterns and potable water applications. Our foam cutting equipment can be used for different applications and can cut virtually any shape, size or diameter. Our unique foam coating system ensures long lasting and reliable quality. We have the ability to produce fire resistant foam products and can test for density and fire resistance.